Everyone arrived at RAF Wittering and made sure all equipment was checked along with medical forms and travel documents. Met at 0300, loaded the MT minibus and drove to Luton airport. Checked in around 0500, we had a minor issue with luggage as the excess baggage allowance only covered 20 bags and we had 21 so the Boss had to pay for an extra bag. We got through and boarded our plane which flew at 0655, landed at 1115. We picked up the 9-seater hire car, dropped off our kit at the accommodation and bought groceries for the week according to Alex’s meal plan. Later, we walked the local area to source the dive centre and locations for the following day. Lectures in the morning for the novice divers (Alex, Jack, Leon, Robin, Vinny) taught by Ken, the experienced divers (Boss, Barley, Finn, Paul) went on a morning dive shake down dive with Misty. After our packed lunch, we all went down to Playa Chica for the novices first dive; going through kit and equipment and basic drills. Robin and Vinny were instructed by Sam and the other three taught by Ken. 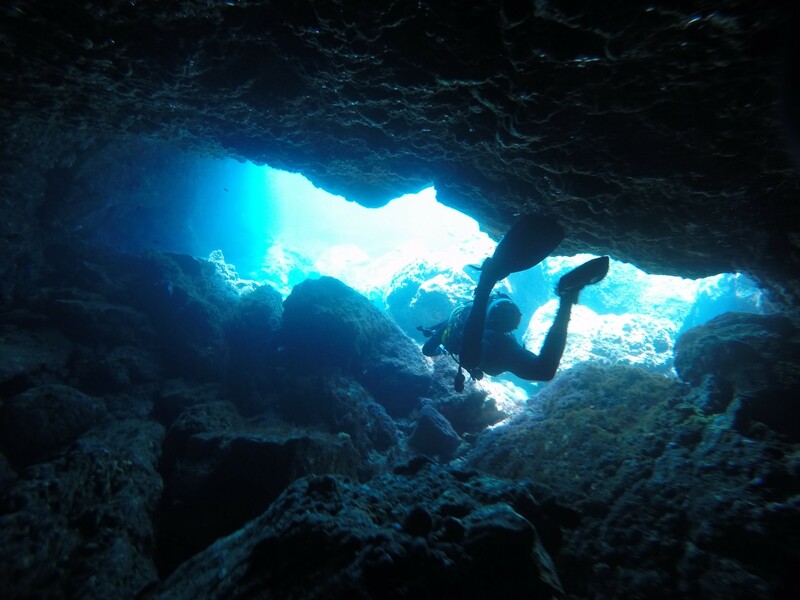 Some of the group saw an angel-shark, and the experienced group explored a cave 30m deep. After diving we bought some more groceries and made chicken pesto pasta for dinner. The rest of the evening was spent participating in a local quiz. 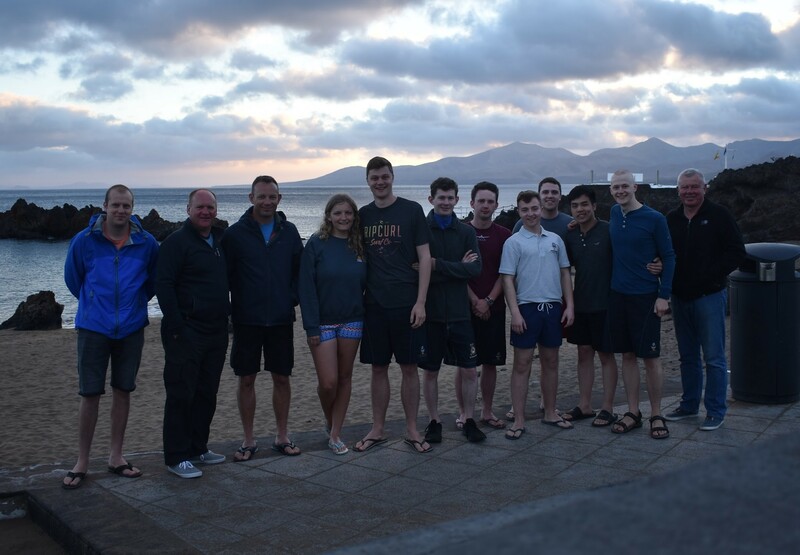 The novices had their last lot of lectures but didn’t get to dive at the beach due to choppy conditions so we continued our drills in the hostel swimming pool which met the intended aim. 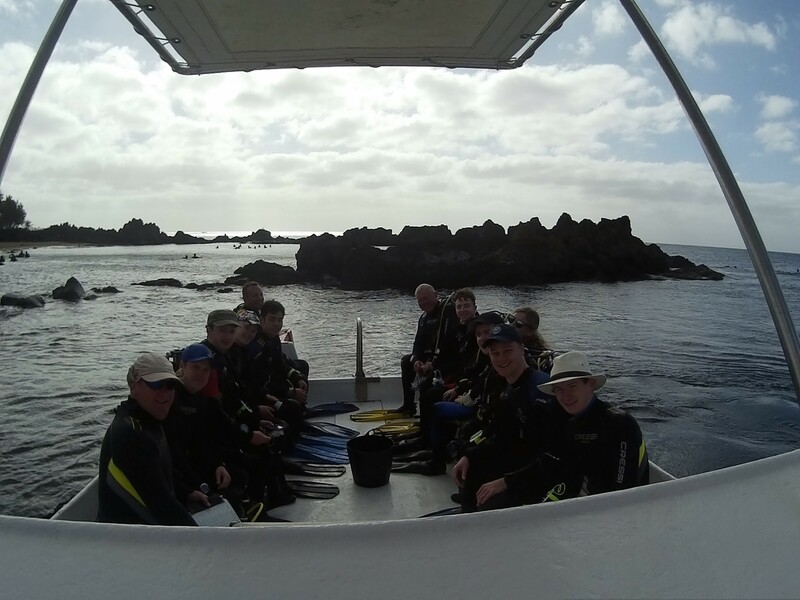 The experienced group checked out a dingy wreck in the morning and a pier dive in the afternoon lead by Finn. For dinner, everyone cooked paella which was a very tasty success. In the evening, we sat around in one of the rooms having a good laugh. Robin also agreed to let us give him a haircut, which although was rather short but turned out well. Morning brief was at 0930, and the we had our morning dive at around 1030 and second at 1300. The novices went through the SEEDS brief and BAR checks and in the water performed the mask clearance and Alternate Supply drill. This was their first proper dive and got to explore some rocks and marine life, including an octopus! The experienced group split up and joined the novice groups, apart from Finn and Misty who went off to dive deeper. The whole group had a general admin chat back at the hostel and then got refreshed before dinner. The rest of the evening was spent playing word games. 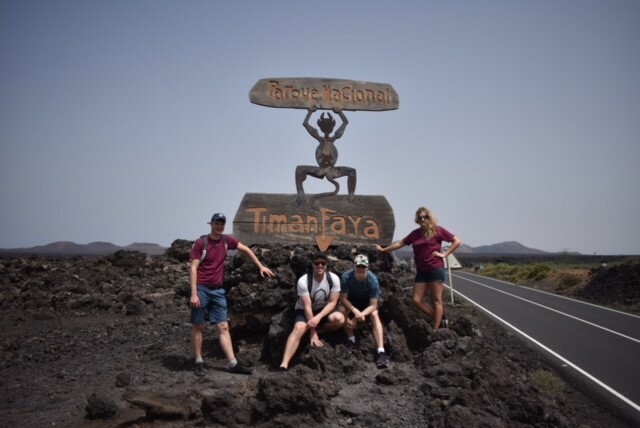 The groups had reshuffled so that Finn and the Boss were safety divers for the novices and Barley and Paul went diving with Misty off the boat where they saw a sting ray and huge sea urchins! Robin and Vinny completed their first dive lead and so had done all the practical requirements and then passed their exam later that afternoon to become qualified Ocean Divers. After diving all the students went to a beautiful stretch of beach where Vinny showed off his impressive Ultimate Frisbee skills. Paul, Finn and Barley dived with Misty in the morning and saw an angel shark. The three remaining novices split up now that Sam was free to help instruct, and they completed their practical training. Robin and Vinny went with the Boss on the boat to explore a different boat wreck. 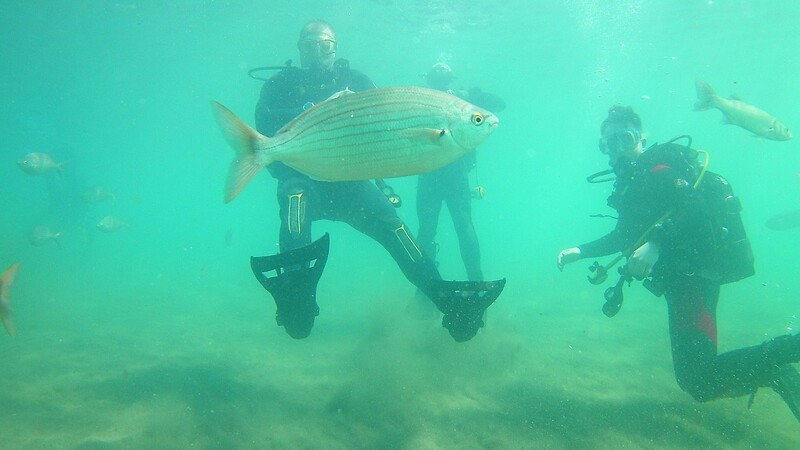 Jack, Alex and Leon sat their Ocean Diver exam but unfortunately Leon didn’t pass first time. In the evening as there were no theory lessons, we took the opportunity to explore the local area. Due to having done four days of continuous diving we had to have a 24-hour period of no diving so our first dive wasn’t until 1300. Everyone buddied up and went to their respective depths, some buddies even explored a cool cave underneath the pier. Leon passed his retake exam and become a qualified Ocean Diver. After that, time was our own until the night dive! All the students buddied up and explored the marine life at night, there were a few more fish and Barley and Robin saw a large octopus. Night diving was an amazing experience that we all, especially the novices, really appreciated our training and skills – when you can only see what is in your torch beam, whilst being underwater really concentrates the mind. Everyone got the chance to go on the boat and explore the wreck beneath. Everyone also saw huge sting rays and a few sharks! The second dive was brilliant too, most people went into the cavern underneath the pier. Vinny and Jack also got up close with a big barracuda and a grouper! Leon had a nightmare and lost his mask and his GoPro, thankfully he managed to retrieve the GoPro. We all got on the boat for the first dive which dropped us off along the reef to the East. There were a few octopuses hidden and loads of trumpet fish. The second dive was a nice casual dive around the shore of Playa Chica. In the evening, Finn, Barley and Vinny went for a lovely stroll along the beach and had a chuck about with the frisbee. Our last day of diving. We unanimously decided to do three dives today to maximise our training. The first dive was at the wrecks; Vinny and Robin got ridiculously close to a couple of huge Rough-tail Stingrays! 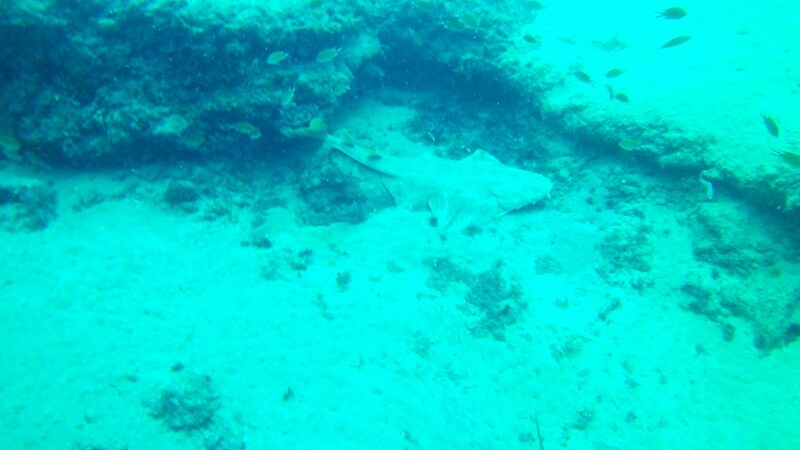 On the second boat dive along the reef there were loads of small Round sting rays and a couple of angel sharks. The third dive was back along the shore; most pairs saw a barracuda and octopus. We gathered all our kit and washed it thoroughly and left it to dry on our balconies. We then cooked some unbelievable burgers. This day was mostly spent washing, drying and packing our equipment ensuring all was in good order for the return journey. 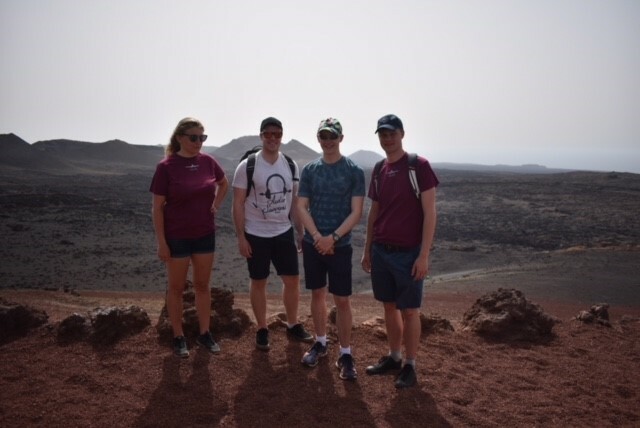 Alex, Barley, Finn and Robin took a bus to the national park on the other side of the island and walked down a long road (good Nijmegen practice) to explore the volcanoes. We all gathered together for a barbeque by the pool for our final meal. We announced the awards of the exped and presented the instructors with their gifts; the gifts were a bit underwhelming but we couldn’t find anything that good. Nevertheless, we all had a good laugh. The students then sorted all the scuba kit for the mornings transport. We met in the morning to check out at 0900. We got a coach to the airport and checked in. We signed the exped Fedora as a memento to keep at THQ. We eventually boarded the plane at around 1320 and landed safely back in the UK. Then the hard work of returning all the kit began. Once back at RAF Wittering the Boss took all the kit into his house so he could return it to Bicester the following week. We all then departed via various means to return home and begin revision for our uni exams. This expedition was excellent. The students learned so much and are all extremely grateful to the staff and instructors. We all gained excellent experience of leadership, fellowship, team working, communication skills, coupled with tests to our ability to formulate and organise plans with continually changing parameters. Our sincere thanks go to all those external agencies who provided much sought after funding to enable us to gain such immeasurable qualifications and skills. Without your superbly kind assistance this would simply not be achievable. I have been a member of Cambridge UAS for only 5 months and have thoroughly enjoyed every facet of my time on the squadron. I had no idea I would get the opportunity to experience an overseas diving expedition with this organisation when I joined and did not expect to be in such a position so early into my membership. I certainly had no clue what I would gain from such an expedition. I am a reasonable swimmer but had never attempted any sub aqua activity before. The surreal environment became rapidly clear to me on day 1 when part of my training was to just place my head underwater with a mask on and my regulator in my mouth and take 3 breaths. I panicked and could only manage 1 breath. It took a short while to get used to this unusual feeling but with the excellent teaching, guidance and direction of the instructors I was able to progress well. By the end of the first week I was leading my buddy diver to a depth of 20 metres for around 30 minutes underwater. When I look back now I am absolutely amazed at how much I have learned. Not only about myself and being able to push my comfort zone boundaries but how to manage and lead others in a rather unique environment. Whilst we were away, my secondary duty was to be responsible for all the food. This again was quite daunting – having to supply food, instructions etc. to 12 people all with different likes and tastes. Before departure I took lists of food likes and dislikes and prepared a sample menu and sought approval from the expedition members. With a few tweaks that was finalised. I then prepared cooking instructions so that those without any cooking experience could follow and hopefully muddle through to a solid meal with no risk of food poisoning. My next challenge came when we found the local supermarket – I had not appreciated that the food stocks would be different and that quite a few of my items were not available. I ended up having to alter menus to fit with food availability. With a little help form a couple of the others we sorted it and all feedback from the students and the Boss was very positive. In summary, the skills I have learned in a very short time period because of the nature of this expedition have given me the confidence, ability and enthusiasm to strive to better myself in whatever I do. I am extremely grateful for everything the UAS organisation has given me and undoubtedly I am a better individual for it. This outcome could not have been achieved without the support (especially financial) of external organisations such as the Ulysses Trust. My wholehearted thanks go to them and all the others.